Today was my daughter’s first day of kindergarten. It was a pretty big deal so I decided to commemorate the day with a little photo session. I printed up a sign and had her pose with it. As you can see she’s a bit of a ham when the camera comes out. 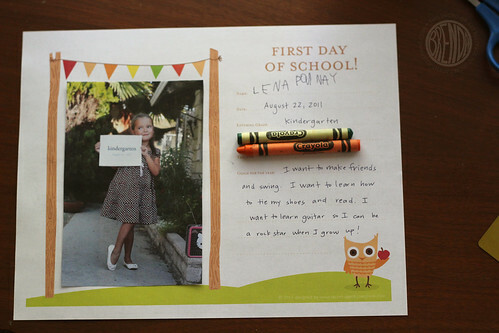 Then we went inside and made a scrapbook page to commemorate her first day of kindergarten. I created a print-out with her name and class information and then a few lines to write her goals down. She can write her name so I let her fill in that part. The rest she dictated to me. I’ve made one for you if you’d like to play along too. 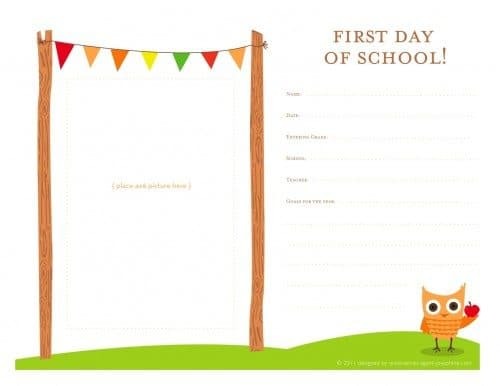 Click here to download your First Day of School printable. I love that she wants to be a rockstar when she grows up but part of me is worried it might actually come true! 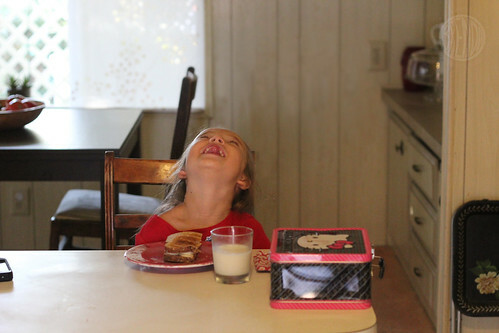 Apparently, breakfast is hilarious when you’re five. Don’t all kids brush their teeth while riding their tricycles? No? Whatever works is what I say. Then off to school she went! I’m so proud of her. Find more Back-to-School Ideas here! Oooooooh! I would love to win a target gift card! Pick me, please! Oh I love that idea, it’s adorable and would make a great keepsake. 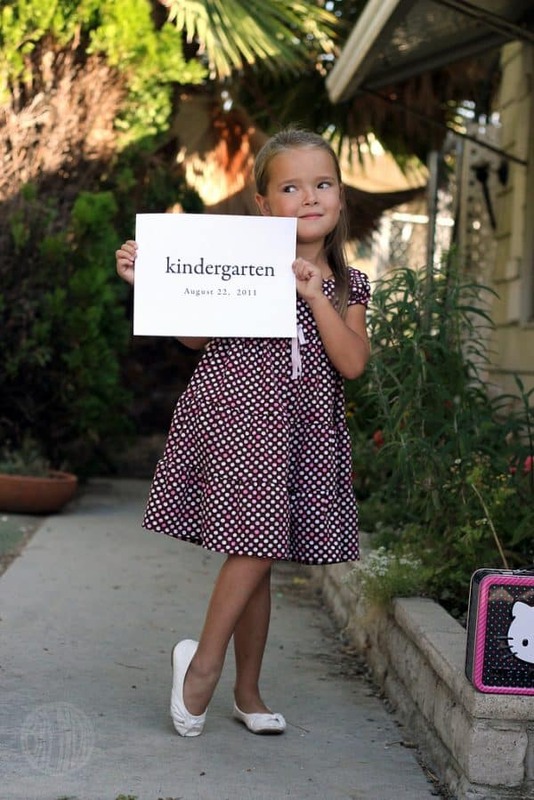 Adorable pictures, she looks so excited for her first day of school! Oh, my kids need new pants, so that gift card would be AWESOME. My 16 month old grew three shoe sizes this summer. To say she needs new shoes would be an understatement! Love first day of school pictures! Love Target! They grow up way to fast! Love, love your printable and photo ideas! Very cute. We start kinder in two days so it’s perfect timing. Also, Target is my favorite shop….shhhh! The printable is adorable! Saving it for the day my little one goes off to school. Sniff sniff. Good thing that’s far away. And of course, Target rocks, too! I have twins that just turned 1 but I am making sure to send the link to this page to myself so I can do this for them in four years when they go to school. How crafty and awesome. Also, your daughter is gorgeous!!! I can’t believe Bug is old enough for kindergarten! I love the scrapbook page idea…and the photo, of course. 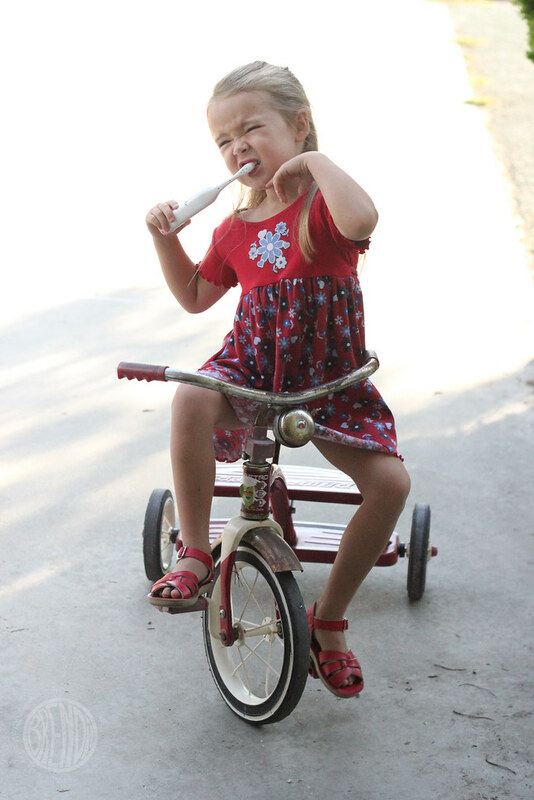 And riding your tricycle while brushing – multi-tasking at such a young age! Your daughter is adorable! My favorite pic is the teeth brushing/ tricycle shot. Way to multi-task! Cool idea. She’s going to get a kick out of reading that someday when she’s older. I love that she is brushing her teeth on a tricycle. That rules. 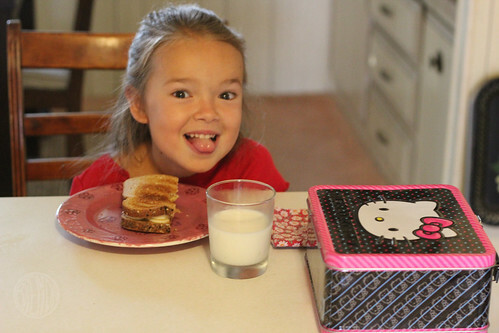 Adorable – I love that the first dress coordinates with the lunch box! Such a cute idea! Have fun in kindergarten Bug! What a fun way to commemorate the first day of school. 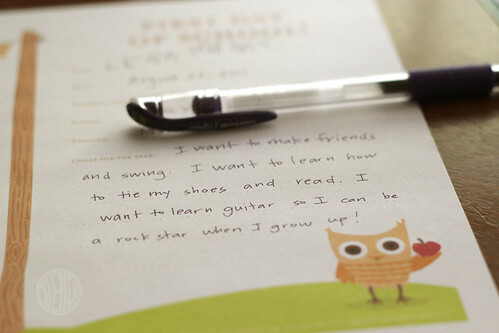 I love the idea of having her write down her goals. That will be fun to look back on over the years! Such cute pictures, I can’t wait to use this with my boys, one starts 1st grade this year the other preschool! Thanks. 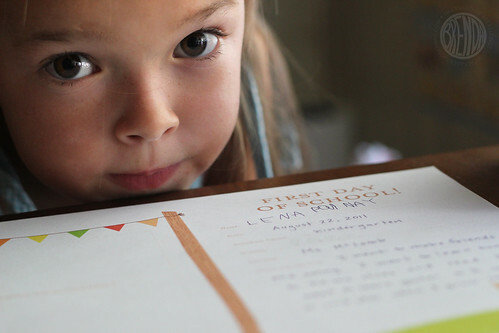 What a great keepsake idea! I could totally use that right now! The toothbrush picture is hilarious! Thanks for sharing. Love the scrapbook page – thanks! I love the idea of taking a picture with the date and school grade. Cute cute! Very sweet! I’m sending a kid to college almost a month from today. Wow. Time does fly! Love the ideas! I will have to do that this year! What an adorable photo shoot and an ADORABLE kindergartener! Bug is starting Kindergarten?! My how the years fly by. Hope her first day was wonderful, and I hope I get picked for the Target card, I could definitely use it! So sweet! 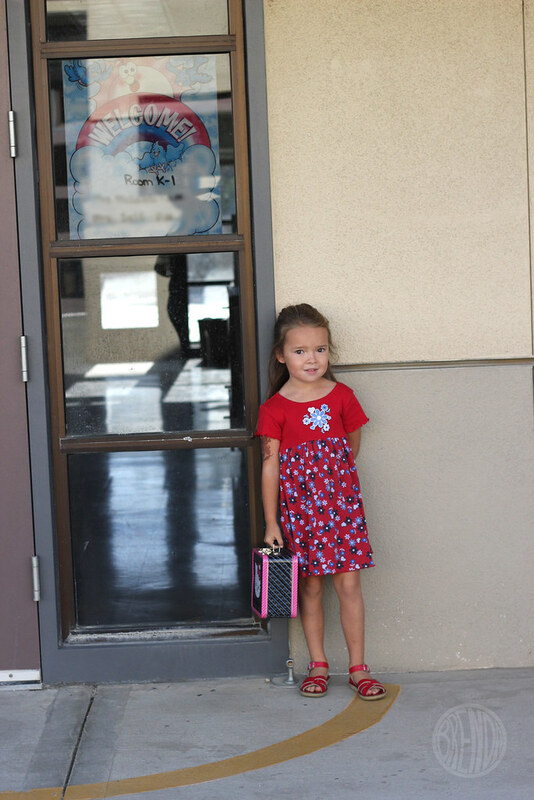 My daughter started kindergarten yesterday also! Happy new school year, fun! Hi, this is very fun. thanks! Love the scrapbook page – thanks for sharing! cute ideas!! I would LOVE to win the gift card too! The pics of your daughter are adorable…and I love Target! Your daughter is adorable! I love the sign she’s holding. What a neat idea! How sweet! I am pregnant with my first and I already feel like the first day of kindergarten is going to come faster than I know it. This is such a fun idea. 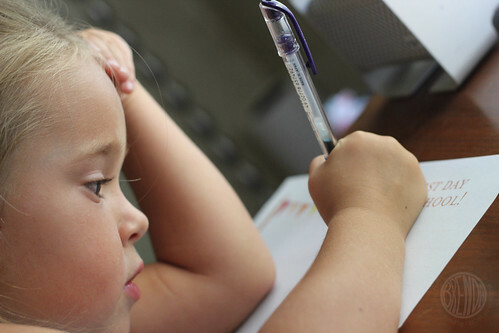 I hope that I can remember it in 5 years when my baby is going off to school! Thanks!! fingers and toes crossed! pick me! pick me! Very cute! Congrats on the first day and many more to come! Wow, your daughter gets a lot done before school! Congratulations to her (and you) on reaching and celebrating this huge milestone. i should try brushing my teeth on my bike before school, she makes it look so easy! The photos are wonderful, Bug is getting so tall and so pretty! I hope Kindergarten is wonderful all year long for you and her.